Adequate dietary calcium intake is needed for optimal bone health throughout life. Self-­imposed restriction of milk has been associated with reduced bone mineralisation, increased risk of fracture and shorter stature. It is difficult to meet calcium recommendations when dairy intake is reduced, while still meeting requirements for other nutrients. Food, especially milk and dairy products, is considered the preferred source of calcium compared to supplements to meet calcium requirements. 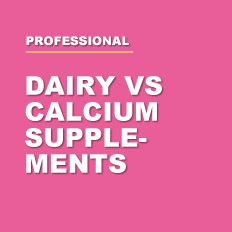 Why is it better to get calcium from dairy products than from supplements? Calcium in milk differs favourably from calcium in other foodstuffs or supplements and these differences are important with regard to absorption in unfavourable physiological conditions. Dairy calcium, which is bound to peptides and proteins, is more likely to remain in solution when the pH is unfavourable, such as achlorhydria (absence of hydrochloric acid in the gastric secretions of the stomach). Dairy calcium can be absorbed in the absence of vitamin D, under the influence of lactose in the distal small intestine via the para-cellular route. Dairy products do not contain any substance likely to inhibit the intestinal absorption of calcium. 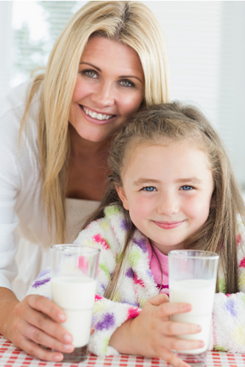 Milk and dairy products provide an almost complete diet, providing several additional essential nutrients for optimal bone health and human development. Low ­calcium diets are therefore generally characterised by low levels of other essential nutrients as well, such as potassium and magnesium. By consuming dairy products, the overall nutritional quality of the diet is therefore improved. Calcium in supplement form is present in various compounds, including calcium carbonate, citrate, citrate malate, phosphate, gluconate, lactate and calcium from dolomite (calcium magnesium carbonate) or bone meal, with carbonate and calcium citrate the compounds of choice. The percentage of elemental calcium provided by these sources range from 9% (calcium gluconate) to 40% (calcium carbonate). Calcium is best absorbed in doses of 500 mg or less, and taken in multiple doses (four times per day) to lower parathyroid hormone levels and decrease bone resorption. Possible drug and nutrient interactions (as listed in the section calcium supplements). The palatability of a high­energy oral supplement is an important factor in ensuring successful implementation and long term compliance. Milk-­based nutritional supplements have been found to be preferred above non-­milk­based supplements, including sweet and salty fruit-­juice­ type products amongst people without cancer, patients with gastrointestinal cancer and malnourished patients. How can calcium consumption be increased in the diet? • Substitution of milk with soft drinks. • Eating away from home results in consumption of foods with a lower calcium density. • Poor parental (and peer) influence could contribute to children making food decisions consistent with a reduction of calcium intake. • Skipping meals, especially breakfast, may limit calcium intake and compromise overall diet quality. • Poor knowledge and negative attitudes towards dairy. • Addressing calcium’s health benefits, recommendations and personal intake could result in a behavioural change to improve calcium intake. • Weight and fat concerns as a result of the mis-perception that dairy products are fattening. • Taste is the primary factor influencing the intake of dairy products. Raising the awareness of the wide variety of dairy products available in different forms and flavours to satisfy different preferences could contribute to higher calcium intakes. • Lactose intolerance. Gradually increasing intake of lacto-se­containing foods can improve tolerance to lactose. 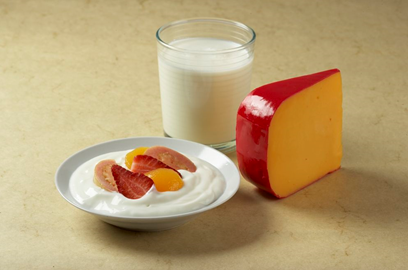 Consumption of calcium-­rich foods, specifically dairy, is the preferred manner to achieve optimal calcium intakes. Calcium supplements should be an addition to and not a substitute for foods naturally containing calcium. Individuals who choose to meet their cal­cium requirements through calcium-­fortified foods, which are usually characterised by a low density of other nutrients, and/or via calcium supplementation should ensure that their requirements for other nutrients are also met.1 The adequate consumption of milk and other dairy products is an easy way of obtaining an adequate calcium intake, while also increasing the nutritional quality of the diet. Individuals who choose to meet their calcium requirements through calcium-­fortified foods, which are usually characterised by a low density of other nutrients, and/or via calcium supplementation, should ensure that their requirements for other nutrients are also met. The adequate consumption of milk and other dairy products is an easy way of obtaining an adequate calcium intake, while also increasing the nutritional quality of the diet. 1. Miller et al. 2001. J Am Coll Nutr. 20(2): 168­185S. 2. Weaver CM. 2006. JADA. 106(11): 1756­1758. 3. Gueguén L & Pointillart DVM. 2000. J Am Coll Nutr. 19(2): 119S­136S. 4. Straub DA. 2007. Nutr Clin Pract. 22: 286­296. 5. Anderson DM. 2008. Nutrition in bone health. In Mahan LK & Escott­Stump S. Krause’s food & nutrition therapy. 12th ed. WB Saunders. London. 6. Gallagher ML. 2008. The nutrients and their metabolism. In Mahan LK & Escott­Stump S. Krause’s food and nutrition therapy. 12th ed. WB Saunders. London. 7. Boland MJ et al. 2010. BMJ. 341: c3691. doi: 10.1136/bmj.c3691. 8. Rahemtulla Z et al. 2005. Clin Nutr. 24: 1029­1037.